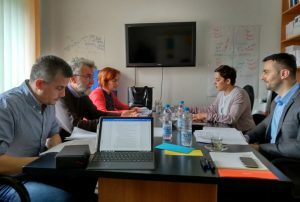 The first workshop of the working group for the development of a model guidelines for reporting corruption and whistle-blower protection in the Republic of Srpska was held. Guidelines adoption is an obligation arising from the Law on Protection of Persons Reporting Corruption. The working group consists of representatives of the Ministry of Justice, the Ministry of Administration and Local Self-Government, the Chamber of Commerce and Eda. The workshop was moderated by representatives of Eda. The workshop was held within the project “Support to the Governments of the Federation of BiH and the Republic of Srpska in the fight against corruption”, which is supported by the British Embassy in BiH.